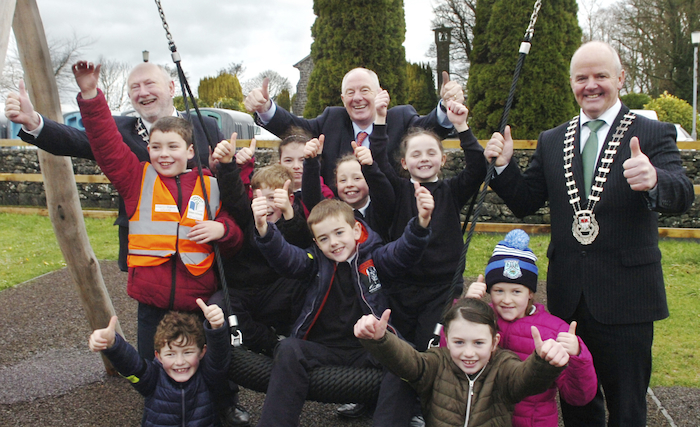 Thumbs up for new playground: At the official opening of the new Belcarra community playground, local school children were joined by Cllr Michael Kilcoyne (Cathaoirleach Castlebar Municipal District), Minister Michael Ring, and Cllr Blackie Gavin (Cathaoirleach of Mayo County Council). Photo: Henry Wills. An allocation of €500,000 for the Lecanvey to Bertra section of the Clew Bay Trail was announced by the Government this week and marks some major progress in the development of the new tourist amenity which is designed to cater for pedestrians, cyclists and visitors to the county. When completed, the Clew bay Trail, which is being administered by Mayo County Council, will comprise a 19km walking and cycling trail along the southern edge of Clew Bay, between Belclare and Louisburgh, which forms part of the Great Western Greenway - and provide a safe and secure viewing point for visitors, walkers and cyclists to enjoy panoramic views of Clew Bay and its many surrounding attractions while exercising in the outdoors. The announcement of the funding was made by Minister for Rural and Community Development, Michael Ring, who stated: "I am delighted to allocate €500,000 for the Lecanvey to Bertra section of the Clew Bay Trail. This investment will provide the people of Mayo and those who visit our county with a wonderful way to experience one of the most beautiful parts of the country. "Last year, I allocated €984,000 for the construction of the Clew Bay Trail and this further allocation of €500,000 will go a long way towards advancing the project. This will be a wonderful addition to the Great Western Greenway. "We are blessed with wonderful natural beauty here in Mayo and the Government has invested heavily in recent years in providing local walks, trails and greenways in scenic areas throughout the county. I strongly encourage people throughout Mayo to get out and enjoy these wonderful facilities. "Facilities such as the Clew Bay Trail make Mayo a more attractive place to live in and to visit. My role as Minister for Rural and Community Development is to support rural life and livelihoods. By allocating this funding, I aim to help enhance the quality of life for people living in Mayo and to help attract more visitors - which provides such an important economic benefit to the county. "Improved recreational facilities significantly enhance the quality of life for people who live close to the projects and also support sustainable economic development in rural areas. We have seen this time and again with the projects supported by the Outdoor Recreation Infrastructure Scheme since its introduction in 2016."